When it comes to making your home comfortable during the hot months of the year, there is nothing quite like air conditioning to get the job done. Depending on the type of home you have, the climate you live in, and the layout of your home, you may want to invest in either ductless or central air conditioning. Both will cool your home, making it more comfortable during the warmer months, but they are installed and operated in radically divergent ways. Below, we will outline those differences for you, so you can make a better determination of which one is right for your home. Air conditioners are similar to refrigerators in that they control and regulate temperatures. They work by converting specific liquids into gasses and then back again. When this conversion happens, it condenses the air and cools it. A fan then circulates this air throughout your home. While it is possible to just place a small window unit in any room of your home, most people opt for a whole-house system, of which there are two types – ductless and central. Central air conditioning uses ducts to deliver the air equally to each room of your home. If you already have forced hot air installed, central air conditioning can use the same ducts, or new ducts can be added just for the purpose of delivering the chilled air. 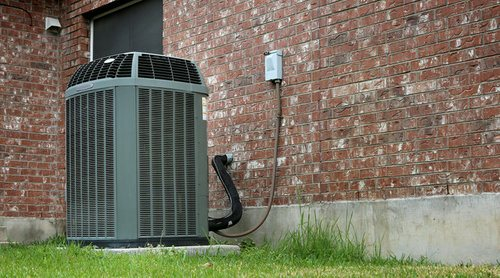 A central air conditioner is usually installed outdoors, although in some cases they may be mounted on your roof or in your attic. Because they are not part of your living areas, they are relatively unobtrusive, with only the vents showing. Ductless systems, also known as a mini-split system, install right into the walls of your home. They do not use ducts, which makes them less expensive to install in homes that do not already have ductwork, and are more energy efficient because they do not lose energy as the air travels, like the way central air conditioners do. Ductless units are more visible, as you see them on the wall, and to cool your entire home, you may need more than one. However, you can use them to cool specific parts of your home, or even use them in conjunction with central air to create separate zones for areas that are not used as often or for areas that need additional cooling. If you already have ducts installed in your home, the installation of a central air conditioner is relatively straightforward. 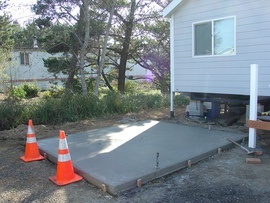 The unit is placed on a concrete pad 1 outside and hooked up to your existing ducts and HVAC system. If you do not already have ducts installed, then getting central air conditioning can be a time-consuming and difficult installation. This is because ducts must be run throughout your home, from the air conditioner to each room. This involves cutting holes in the walls, floors, and ceilings, as well as running the ducts themselves, often through areas like attics and closets to disguise them. Ductless air conditioners are much easier to install in homes that do not already contain ducts. They fit directly into the walls but can also be suspended from the ceiling or installed in a drop ceiling. 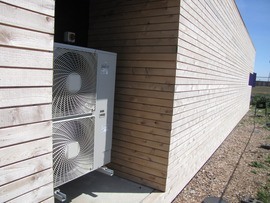 The condenser is kept outside, and only hoses are needed to travel between the units. Only a small hole is required to install, which makes the installation fast and simple. You can purchase units that will handle a single room or up to four rooms at a time. In the case of central air conditioning, your costs are going to be dependent on several factors. The first of which is the unit itself. When selecting a central air unit, you will want to look at its SEER number or its efficiency rating. The higher the number, the less it will cost you to run, but the more it will cost you upfront. The average household will typically use a unit with about 13 SEER, which has an average cost of $3,000 to $4,000 for a 1,800 sq. ft. home. A higher SEER or larger unit will increase the cost. The cost of installation begins around $2,000 and does not include the costs of the ducts. The ductwork starts around $10 a linear foot, with most homes needing a minimum of 200 feet. This further drives your costs up another $2,000, making the average cost of central air between $5,000 and $9,000 for a 1,800 sq. ft. home, depending on whether you need ducts. Ductless air conditioners cost around $1,800 for a single unit. If you intend to cool your entire home up to 1800 sq. ft., you may need a unit that can handle up to 4 zones at a cost of about $3,800. Installation is typically about $20 to $40 an hour and takes roughly 2 hours. There is an additional service fee of $50 for a total of $90 to $130 for labor and $1,930 to $3,930 for the entire cost. With central air conditioning, the air needs to travel along the ducts before it can reach your home. Ducts are notorious for leaking. According to Energy.gov, as much as 30% of the energy you use to heat and cool your home is lost to leaky ducts. 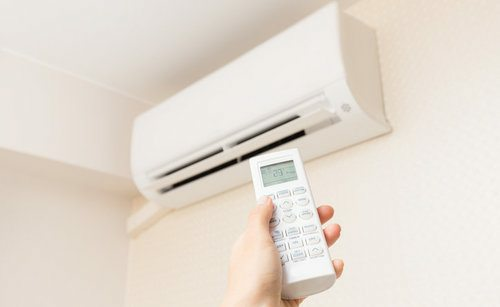 Therefore, a ductless system could save you as much as $1,000 a year in air conditioning costs if you live in a hot climate that uses AC most of the year. Both types of air conditioners will lower the temperature in your home. Because of the way that central air conditioners recirculate air, however, they can improve the air quality as well. Air filters are required to help the unit do its job properly. Investing in a higher-quality filter can remove allergens from the air. Ductless units do not circulate air in this way and do not remove allergens. Central air conditioning systems pump 2 the same amount of air at the same temperature throughout your home. So, when using central AC, your home will remain at a constant temperature. Ductless units provide a similar benefit if you use systems that are made for more than one zone and are sized appropriately. It is possible to use a ductless unit in only one part of your home, keeping it cool while the rest of your home remains warm. Investing in a system with zones can regulate the system better. Ductless air conditioning is less noisy than central air. The condenser unit is smaller and can be located further away from the house to minimize noise. In addition, ducts tend to echo, which can amplify the sounds from central air. Because ductless systems use hoses, there is no echo, so the system is quieter. In most cases, adding any type of air conditioning to a home does not increase its market value, although in some climates not having any air conditioning could make a house more difficult to sell. However, an energy-efficient home may be more marketable, so investing in a ductless system over central air could make a home easier to sell when the time comes. How much does it cost to install ductless or central air conditioning in my city? Cost to install ductless or central air conditioning varies greatly by region (and even by zip code). To get free estimates from local contractors, please indicate yours.